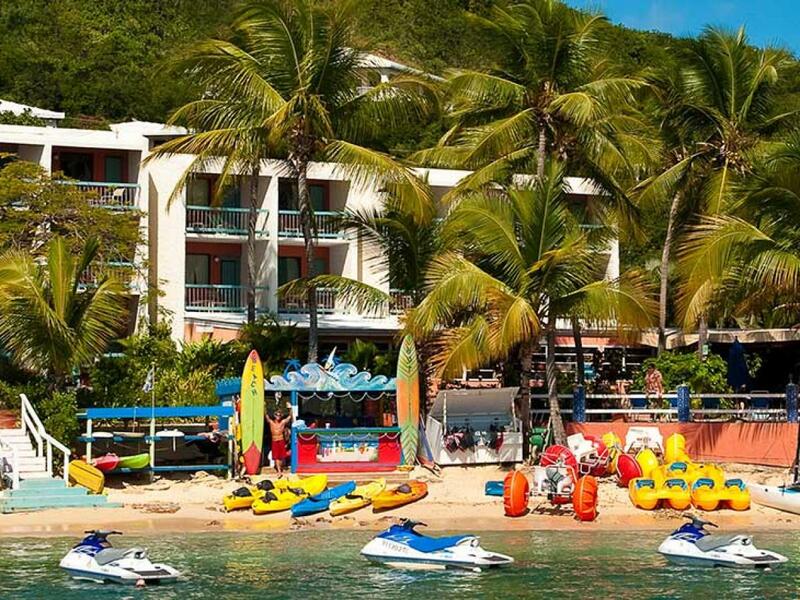 Slip on your flip flops, chill out and have fun at Bolongo Bay Beach Resort on St. Thomas in the US Virgin Islands. Our casual beach resort, tucked in a cove on beautiful Bolongo Bay, is the place for good times with great people.We’re small and personal, with just 62 true beachfront rooms. The sand is literally right outside of your door. And, we have a lot to offer including the best All Inclusive anywhere and live entertainment 365 days a year!Bolongo Bay Beach Resort was just included in Frommer's list of "The World\'s 10 Best Beachfront Hotels" If you are planning a destination wedding, Bolongo Bay is one of the most popular venues for Beach Weddings on St. Thomas, and our Romance Director is here for you from the start to your "I Do's" Here, you’ll feel like part of our family. Mingle with staff and managers – the Doumeng family who has been running Bolongo for more than 40 years. Try paddle boarding or windsurfing on our beach. 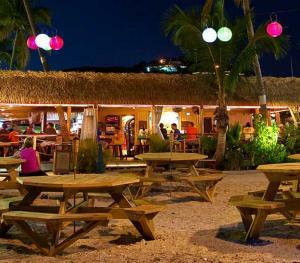 And, join in the camaraderie with our friendly staff and lovable locals after work over ice-cold beers at Iggies Beach Bar. Bolongo Bay Beach Resort is a beautiful, intimate and convenient setting for a destination wedding and tropical honeymoon. Our ideal beach location on St. Thomas in the US Virgin Islands means that no passports are required for US citizens. Plus, with many direct flights, it is easy to get here. 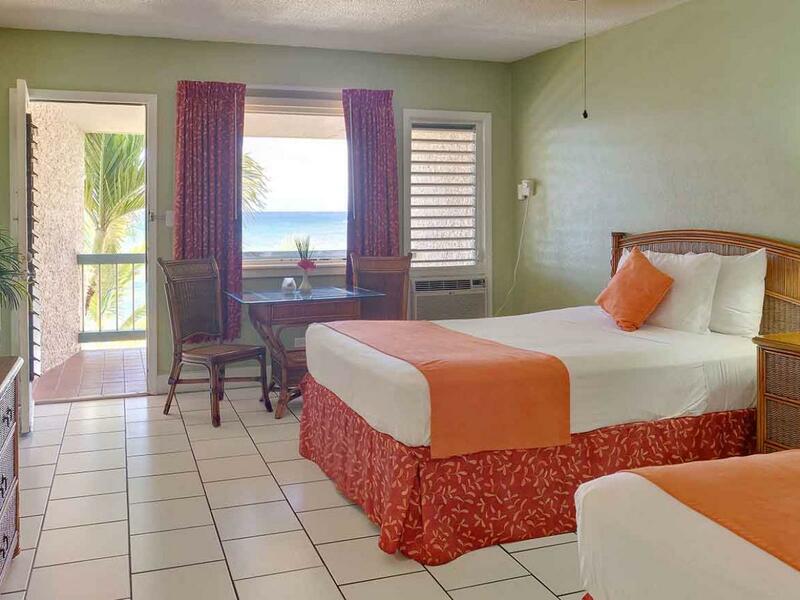 And it’s affordable to stay here with Bolongo Bay’s choice of European Plan (room only) or All Inclusive rates. Destination Beach Wedding of Your Dreams Say “I do” with your feet in the sand or on the sea at sunset aboard our 53’ catamaran Heavenly Days. Every destination wedding package is completely customizable to make it your perfect day. Our dedicated Romance Director, Lorena Leonard, and talented Special Events team will turn your every wish into a reality for your big day, and guide you through the planning process every step of the way. From your first phone call or email to your “I Do” she is here for you. Join our Bolongo Brides (grooms welcome too) Group on facebook, and hear directly from our past wedding couples. 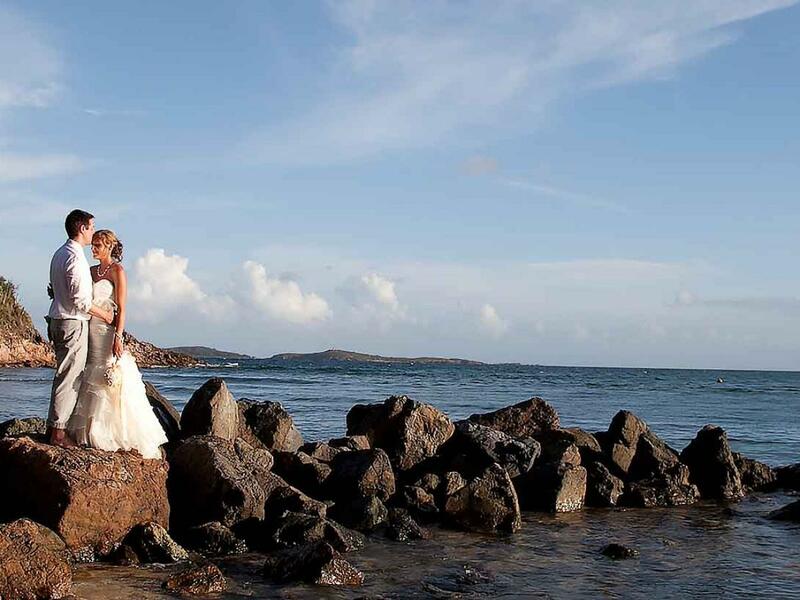 We are happy that love & marriage is now recognized for all, and hope you choose Bolongo Bay for your special day. View our Wedding Gallery. Memorable Honeymoons, including the Island’s Best All Inclusive After your big day, celebrate your love for one another on a romantic honeymoon at Bolongo Bay. 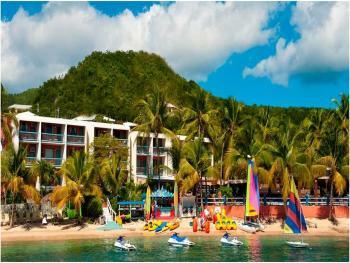 Choose from several honeymoon packages, including the best All Inclusive experience in the Caribbean. Lounge together in a hammock on the beach or frolic in the surf by day. 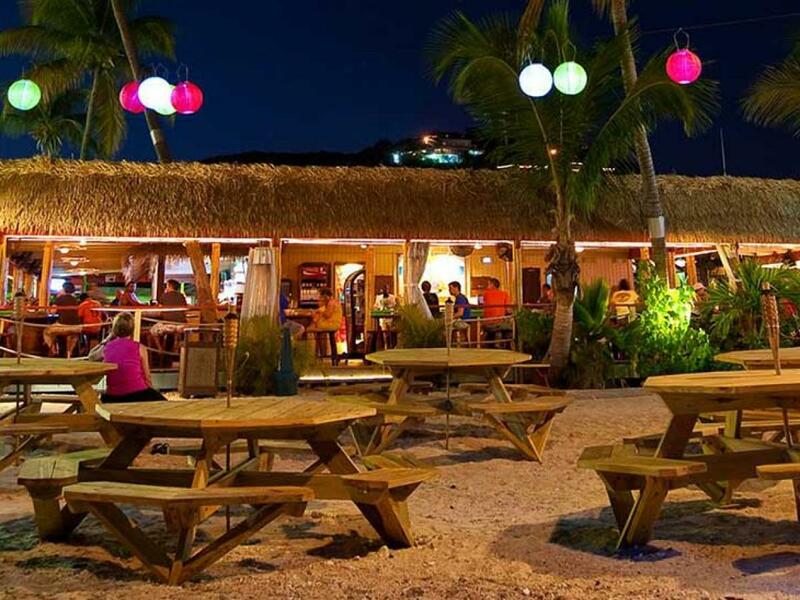 At night, dine overlooking the Caribbean Sea and dance to live music under the stars. Explore our many honeymoon packages, including All Inclusive. 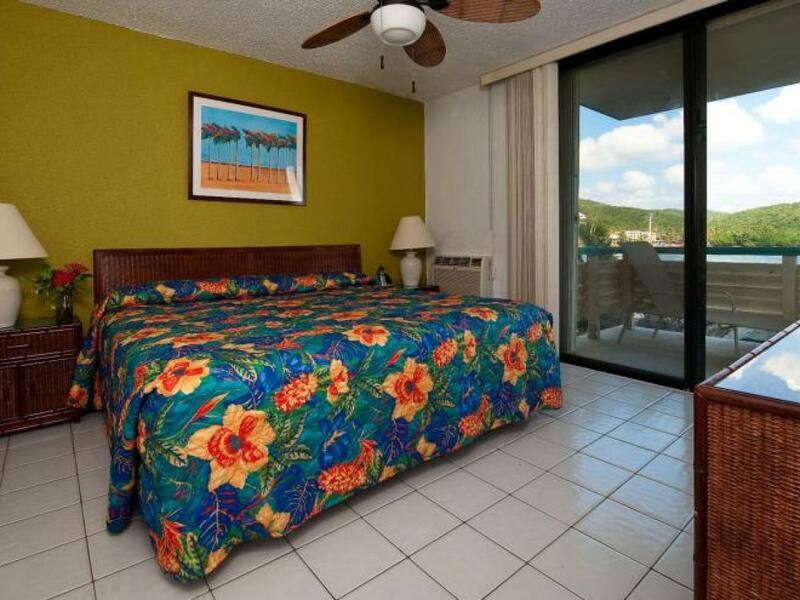 This is a first floor room with beach Access from the balcony. Bedding: 1 king bed or 2 queen beds. The restaurant formerly known as The Lobster Grille is currently open as “Iggies Oasis” following the hurricanes in September. Chef Ryan has come up with a tasty smaller menu and as a patron you have pool use so take a break in your day and stop by for some great food, cocktails, sports TV’s and a dip in the pool. Kitchen is open from 11am to 9pm, bar stays open later. 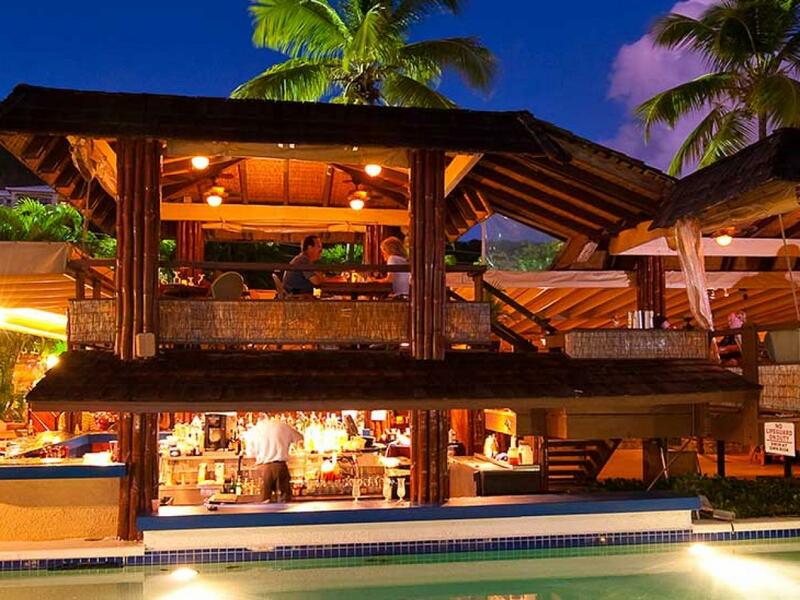 The Lobster Grille provides a relaxing atmosphere for breakfast, lunch and dinner. 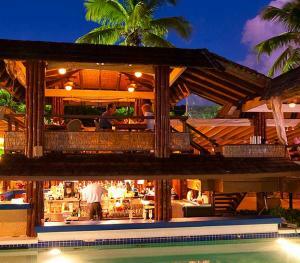 The two-story, open-air restaurant edges our beachfront pool and offers beautiful ocean views. Start your morning with a hearty hello from Viola, our Bolongo Bay ambassador, and coffee or Mimosas (you are on vacation). Fuel up with Caribbean Eggs Benedict or Banana Foster Pancakes, or go light with a fruit and yogurt parfait or slice of our fresh-baked banana mango nut bread. For lunch, try one of our fresh salads, lobster flatbread pizza, or French Town Dip. Join us for happy hour (served 4 to 6 pm daily) and toast the day with a martini or glass of wine selected from our wine list.